Hole #16, tee shot veered right, leaving me 165 yds to middle of green but trees blocked my shot. I pulled my old Cobra Bio Cell 2H(16.5*) and set up a fade. The call bent around the trees stopping about 2 yds from the left side of the green. I was very pleased. Hit a poor drive on an uphill par 4 left me normal pitching wedge distance but being in the 30s I hit a 9i to 15 feet then proceeded to miss my putt. Hehe seems to be a general theme on this thread..
Great shot, missed the dang putt! We arrived at 10. I had a nice front 9, 37 and haven't had consecutive sub 40 nines in a while. The back is a couple of strokes more difficult than the front. 10 is a par 3 that ranges between 160 and 190 depending upon the Tees and pin placements. The green is huge but extremely narrow and sloping from right to left. There's water short and traps front and back with OB left. It took us a bit to find the pin a that's how far back right the pin was. It was 163, uphill over a trap,wind a bit down and left to right. My friend, Dennis, who hits a natural fade, hits first. He doesn't have the honors but that's Dennis. He hits 6 hybrid into the middle of the green. Dennis is longer than I. But it looks like 6 iron to me. So I open the face a bit and aim over the left edge of the trap, push it a tad and the ball flies straight at the pin, lands a few feet past the hole and rolls to the back. I have 20 feet for birdie. I wish that I could tell you I made the putt but having an easy par on that hole led to 39 on the back and 76 for the round for certain. From Jersey, was out in Zona last week so everything was flying further. 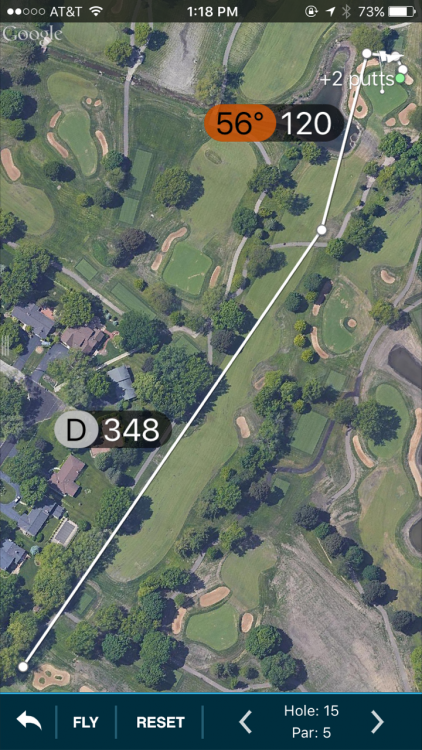 550 yard par-5, piped a 3wood about 335 (the carts had GPS, what a feature! ), followed with a 7-iron to about 8 feet and buried the putt. Each shot set up the next one so it's tough to pick one, but if I had to I'd say the 7i. Hole of the year so far for me. To set the stage, I am in Maui on vacation at the end of Feb. I've golfed twice already, shot 111 at Wailea Gold and 110 at Kapalua Plantation, so I didn't have much confidence heading to Wailea Emerald. Par 5 9th hole and I smoke my drive for the first time that day, 260+ right down the middle. I have a downhill approach to the green, about 185 from the front so I pull 6 iron. Hoping to hit a nice fade somewhere close to the left side of the FW so I can chip it close. Instead I hit a draw that looks like its ticketed for the front bunkers. It carries the bunkers, hits the right rough pin high and hops onto the green rolling out to about 6 feet for a 198yd shot. As you might guess, I miss the eagle by about 3 inches but convert the birdie. Shot 94 that day to give me a lot more confidence heading into the season. 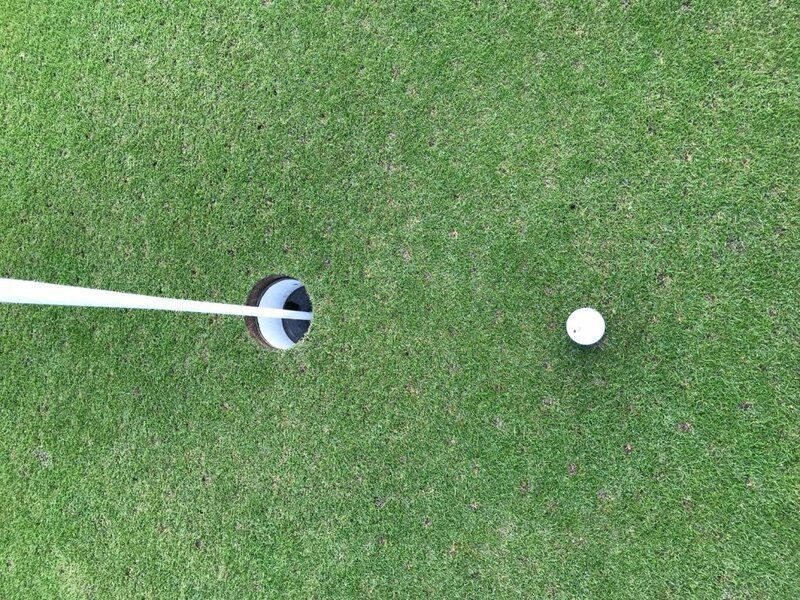 9 iron, 120 yards to this close pin, yes made the bird. Last tournament I played in. I wasn't scoreboard watching (via iPhone app) but I figured I was likely in the lead. But made a double on 17, so I came to 18 figuring I'd win with a par. Hit a great drive about 280 leaving me 140 into the green. Hit a solid approach but it came up way short (as did most of my playing partners - wind must've been much stronger than we all thought). Hit a good chip but it checked up real early instead of rolling out. Now I have 20ft uphill right to left for par. All playing partners have closer putts. I give it a good run with my ER-2 and she falls. I ended up winning by 3, though I didn't know it at the time. Both the drive and the approach were tied SOTD for me. Gives me delusions of adequacy. I was in the left woods 160, light rough, lots of trees but an opening. I said d to my playing partner that I was just getting big to play it safe. He thought that meant a pitch out side ways but I hooded my hybrid, lined it through the opening, between green side bunkers and right to the back fringe of the green. 2 putt par tied the hole against my opponents two putt birdie. I was getting a stroke. Par 5 #13 at Babe Zaharias GC....I usually hit driver, 8i, then PW to green by going around the water. Today, however, I went Driver(231), 5W over water(160),chipped Putter from 1 yd off the green hitting the pin, One putt(1 yd) for Birdie!WooHoo! That got me a $24 Skin! I think I had my shot of the year on Monday night. I was playing Mt. Prospect Golf Course outside of Chicago in my golf league. The two previous holes I'd bombed my driver 280ish but wayward left and right ending up in bad lies. I got to the 480 yard Par 5 15th hole. It's a straight hole, but it has a pretty narrow fairway that is best suited for draw. Typically, I will hit hybrid off the tee to set myself up for a nice layup. At 200 yds, its about 30 yards wide, at 250 yards its 20 yards wide before opening up again. I decided to hit driver because I was down in my match and needed to make something happen after my opponent hit a decent driver about 220ish towards a right fairway trap. We are playing with the wind this hole which is blowing decently and the fairways are pretty firm because we haven't had rain in a few weeks. I lashed a beautiful baby draw out there. I felt good about the distance, but twice before I've had similar 280yd drives that ended on a steep hill on the right side leaving me with no shot at the green. I get up to the hill where I figure I should be and its not there. We keep walking forward and eventually find it in the rough on the right side for a 348yd drive! I've never hit one anywhere close to that distance in my life. I had 109 left to a front pin so I figure I'd hit a gentle sandwedge and hope I can leave a decent eagle opportunity. Instead I pull it left and long. Then I chunk the chip. Then I chunk another chip into a trap. I actually hit a decent shot out of the trap and 2 putt for a 7. Long live the high handicapper. For me it was hitting an 80yd shot, 15yds short of the hole and then dropping the 30ft putt to save par.